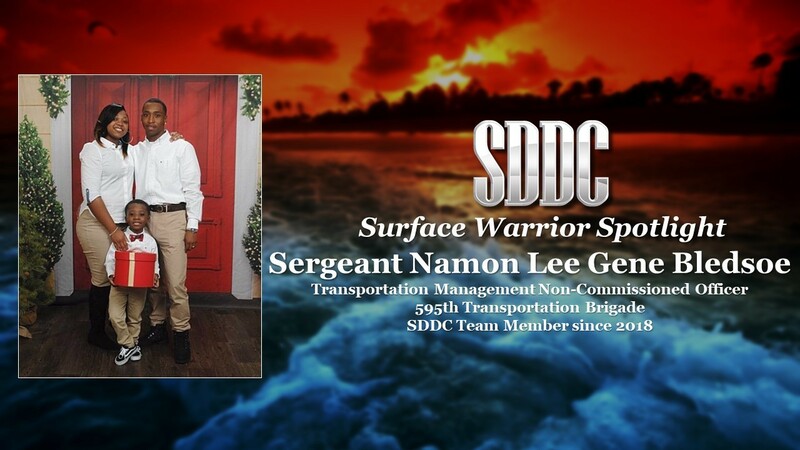 The latest iteration of the Military Surface Deployment and Distribution Command's (SDDC) Surface Warrior Spotlight (SWS) shines like the desert sun onto Sgt. Namon Lee Gene Bledsoe, a transportation management noncommissioned officer with the 595th Transportation Brigade at Camp Arifjan, Kuwait. Bledsoe, who has been assigned to the 595th since last November, was nominated by his leadership because he shows exceptional dedication to, and outstanding performance in, tracking vessel movements in the brigade's current operations center (COC), which focuses on the U.S. Central Command area of responsibility. He and his wife Dominique have been married for three years and they have a three-year-old son. He has served in the U.S. Army for five years and is proud of his service, striving to do the best he can every day with the goal of becoming a drill instructor -- something his chain of command says he is on the right path towards. Now it's time to bring Namon into the Spotlight. A: I was stationed at Hunter Army Airfield in Savanah, Georgia. When I was there I worked at the Arrival and Departure Airfield Control Group - this was interesting because I got the chance to be there when all the Soldiers were deploying and coming home. A: I don't really have a favorite vacation spot. I just like to travel and find things to do in different places. Q: What have been your top three life highlights so far? A: Having my son, getting married and joining the U.S. Army. A: I would choose to be a Juvenile Probation Officer. Growing up in Detroit, I know how it feels not to have anything to look forward to, and for someone to believe in you means a lot. I would take the time to talk with the kids and let them know they have a second chance. A: Loyal, faithful and respectful. A: Working in the COC has opened my eyes to the bigger picture of transportation. Now I see how transportation impacts the readiness of the Army. A: My proudest movement is going to the promotion board and receiving my promotable status. A: To be able to take care and lead Soldiers. A: I would interview rapper Tupac Amaru Shakur. I want to know how he didn't give up going through everything he went through. A: I like to play chess, watch movies and spend quality time with my family. A: There was one time that my mother and I walked across town at 2 a.m. just to get me to my chess tournament. This showed me that my mama would do anything in her power to make me happy. Q: What TV show or movie are you ashamed to admit you love? A: I watch "Love and Hip Hop." My wife makes me watch it with her. Q: What would you most like to tell your younger self at age 13? A: I know you don't think things are going to get better, but keep going and it will pay off. Q: What is your greatest phobia? A: Ever since I was a child I have been afraid of spiders. Q: What are some things on your bucket list? A: Go to Paris and sky dive. Q: What is the one thing that you can't live without? A: My family. They are the reason I do everything I do. A: Basketball. I've been playing for fun ever since I was a child. Q: If you were stuck on an island, what three things would you bring? A: A map and compass, a fire starter equipment and a first aid kit. Q: If you had to eat one meal every day for the rest of your life, what would it be? A: My wife's pepper steak and rice. It is my favorite meal. A: Achieving something that you have been trying to do. Q: What is your personal motto or mantra? A: I wanted to be a police officer. I wanted to be the person to make change. Q: What super power do you wish you had? A: I wish I had the ability to fly. If I did, I would fly my family and me across the world. A: My hidden talent is comedy. I love to tell jokes. A: I want to finish my bachelor's degree in human services and be drill sergeant in the Army. 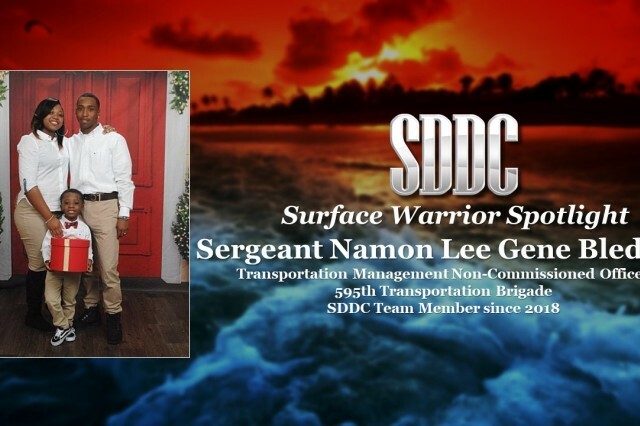 The Surface Warrior Spotlight is a program that highlights different members of the SDDC workforce every few weeks through a series of interview-style questions that focus on his or her unique background, personal stories and experiences.